What is 180°C in gas? When my Elly was a young lady I tried to teach her how to cook. Alas the subject was only of interest if there was something in it for her. In the final few weeks before heading for freedom University I tried encouraging her to assist or at least watch me prepare meals. No mother wants her nestling’s to starve when they leave the safety of the coop. Elly would have none of it, she was far happier with her nose stuck in a book. Hunger was certainly good sauce, she soon learned to cook and occasionally the recipes were coming back across the Irish Sea from Scotland to me. Now she is a very good adventurous and experimental cook. I shared her Tomato, & Peanut soups, as well as her Banana Loaf with you already. During a recent visit, I made the most of Elly & George’s healthy strong arms to stock up on dry goods to keep me going while running in the new ‘shock absorber’ and the associated ban on driving. I also wanted some fresh fruit and veg. In the vegetable aisle, Elly did her usual, “We will have one of these each and one of those” and so it went until we had a very colourful collection. She had a new recipe for me to try and would cook it before she went home. Do you know what I discovered… She doesn’t cook like me, she cooks like her Nana. HER NANA! My mother, never used a weighing scales and the recipes were in her head, ELLY IS NOW DOING THAT! I did ask her for the proper recipe and if you are curious come back in the morning for the surprise. This entry was posted in memories, recipes on August 30, 2009 by Grannymar. That’s not me at all, I always open up the recipe before I start to cook. There’s very few things that I make from memory (probably only my “use up everything in the fridge/press pasta sauce). The weighing scales is probably the most used gadget in my kitchen!! Grannymar, I was just like your daughter – and I hated to even watch my mom cook. I lived to regret that, and when I was a newlywed, I called her 2-3 times a week to ask how something should be done. As to your suggestion about double-clicking on my comment email, etc. – that used to work, but no longer does. It’s very frustrating. Another of my blog and FB friends sent detail instructions last night on how to cure it, and I’ll try it later today. Cooking and chemistry…when you know the basics it’s easy…Ha! ha! I cannot remember simple things like the ratios of flour to fat and sugar and eggs in cakes and pastries but I remember methods. I’m a KISS and bucket cook…. I throw it in and cook it…within reason. Lady Magpie rarely lets me near the kitchen. Why? As an example she cannot stand the idea that I don’t cut up vegetables into precise little cubes. I chop them into chunks..OH! I’m an alliterative cook too! Mind you she is a cross between Ellie and you GM….some things need a recipe, others are pure instinct. I LOVE the receipe for the peanut soup, thanks! I was living alone for several years. Have to admit I got by mainly on fruit, ready meals and boiled eggs. I seldom cooked a proper meal. But now at least I can cook several very tasty dishes which I make when Jenny’s away. Maz – I have a few of the very old recipes in my head, but most are stored in my computer and in hard copy form. I use A5 Folders with wipe clean covers and plastic pockets. They save the recipes from splashes. I have about 4 of these folders. One for starters and soups, one for main courses and a third for sweets/desserts, cakes and tray bakes. The fourth folder is miscellaneous items like dips, jams etc. It also has a very comprehensive food shopping list that I occasionally check before going to the supermarket. I have a page of things like how much wall paper I need to decorate each room and ceiling. Floor measurements, light bulbs sizes and fuses strengths etc. I hope you sort out your commenting soon. Magpie – I like the idea of being a KISS cook – I go with ‘Keep It Sensibly Simple’! Nicola – It is an unusual one from Elly’s student days. Nick – Every man should know how to cook properly! No exceptions. Mmm! Those meringues look good! Grannymar, I too never use measures or scales when I cook. My mother and her sister in law used to exchange recipes over the long distance telephone calls, much to our chgrin as those days, the cost was prohibitive. I have seen my mother gesturing with her hand and fingers the measure of some spice or the other to be added while on the phone and saying something like “this much”, and amazing, apparently, her sister in law could understand and vice versa! Does anybody in the blog world know how to cook a “hot dog”? HELP!! Ramana – Some of my best experiments were the add a little of this and a spoonful of that etc. My Elly talks with her hands even on the phone while speaking French! Do you think it helps the accent? Rummy, were in Grannymar’s garden? We have mislaid the recipe I promised you GM! Sorry! Grannymar, myself and my other half are putting together folders like that now too, his plan is to get a wall chart type thing together with important info like the internal temperature of cooked meat, how long to boil an egg for the perfect runny yoke etc. When we have our own house I’ll definitely put together a home folder, although I have a lot of stuff like shopping lists and christmas plans (yes I am that sad to be thinking about the c word already) on google documents too which I can share with himself! Maz – In the home folder keep swatches of the colours used for curtains, furnishings, floor coverings, paint or wallpaper, and accessories. Sometimes it is difficult to carry a colour in your head when trying to replace something. Bring a measuring tape with you at all times. Showrooms are large and furniture looks smaller in these spaces. My daughter started cooking our Sunday evening dinners when she was 7 years old. We always had hot dogs and frozen corn, her favorite meal. If she could do it, so can you. 😉 Hang in there! I rarely use a recipe unless it’s for a cake or something involving egg whites. I do however have some handwritten stalwarts in my mother’s recipe book which are die hard, tested and true. I guess with so much fresh produce here, I cook from the heart rather than the book. Ellie sounds a bit like my daughter who for now, refuses to cook anything that doesn’t involve chocolate! It’s my son who’s turned out to be the chef. When i was very young, I looked at all the work my mother put into cooking, and then realized that her reward was a sinkful of dirty dishes, I decided never to cook. Little did I realize at the time, how much love goes into a meal. I was a mother with children of my own, before I understood that concept. Why didn’t I help with clean-up when I was a child? My father said, he would help if I would practice the piano the entire time he was cleaning the kitchen. That man could drag out scrubbing pots and pans forever. If I had had any real talent, for the time I practiced I should have had at least one concert at Carnegie Hall. Maynard – If Ramana was in my garden, it must have been while I was sleeping! Magpie 11 – I had forgotten about a promise of a recipe. Jean – I am sure those hot dogs tasted really special! Baino – Elly normally sticks to the savoury dishes, although last Christmas she made brandy truffles and cakes for her in-laws. Maria – I can relate to that. 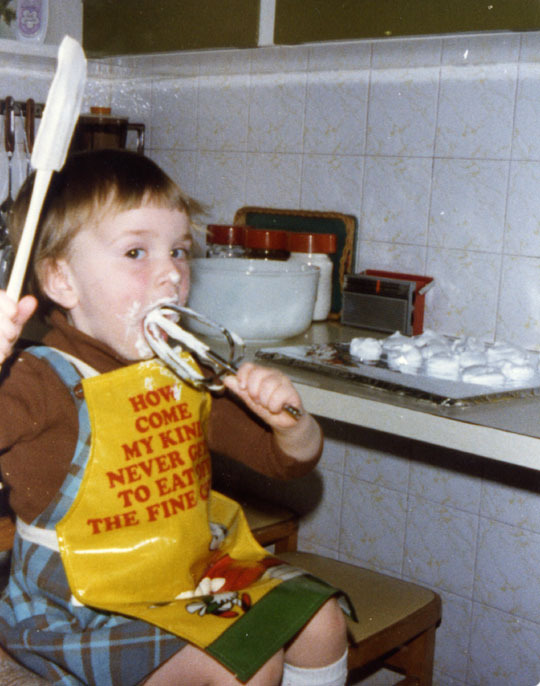 My early efforts at cake making before the days of electric whisks and food processors made hard work of the task and to see a whole cake disappear in seconds, took some time to get used to. Nowadays I love to see a cake eaten in one sitting, alas, it seldom happen since there are never enough people around to do so. I couldn’t boil an egg when I left home, GM, but learned over the years to become a fairly adequate cook, I love to share meals with a full table. I did so last night with a baked ham and scallopped potatoes, etc. My daughters are very good cooks but the grandgirl can’t boil an egg. I think these things run in cycles. WWW – Sharing meals is something I miss. I did have the opportunity on Saturday and it was lovely. I realised that I was actually eating more as I had company to share the meal with me. Those quotes of your Dad sound very familiar. George – the thoughts of eating the food cold for our later meal was enough to make us clear our plates. Mind you it was rare as mammy was a great cook and the usual cry was ‘Is there any more’! I used to worry about my son when he first left home but he was soon ringing up asking how to cook the things he missed – now, Keiron is a wonderful cook and makes it up as he goes along. My daughter, however, can only cook with a ‘step by step’ guide and even then it can go horribly wrong!!! Kate – Hunger is a good teacher, your daughter will learn when she needs to.